A few steps away is the world famous Q1 Observation Deck and only minutes drive to Conrad Jupiters Casino, The Gold Coast Convention Centre, or the finest in shopping, dining and cafes that both Broadbeach and Surfers Paradise are renowned for. With the finest interior furnishings including unmatched comfort and luxury for you to enjoy, Artique Resort is the perfect choice for your next family holiday, or that perfect romantic getaway. With the exciting buzz of Surfers Paradise on our doorstep & one of the world?s most famous beaches just metres away, you?ll find Artique Resort an irresistible destination for your holiday! Being one of the newer resorts on the Gold Coast, Artique has been carefully designed to incorporate almost every holiday desire imaginable. Our discerning guests can immerse themselves in total luxury, relaxing in quiet, air conditioned comfort in stunning apartments that offer magnificent ocean, river, hinterland or Surfers Paradise views! The interior designs are utterly superb & with fully equipped gourmet kitchens, Artique Resort is the perfect place to spend your next Gold Coast holiday! 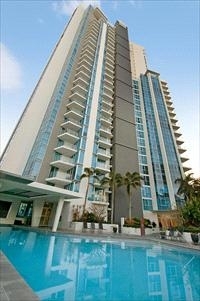 The Penthouse Apartments Complex is a 24 storey high rise situated absolutely on the Beachfront. There are no roads to cross as you can walk out of your unit and put your bare feet in the sand. Every 3 Bedroom Apartment has views of the beach and some have river views and hinterland views as well. Each unit is very spacious and is no less than 17m2 and some 22m2, which is bigger than the average house. Each unit is fully self contained complete with a full kitchen and own laundry. All you need to do is bring your clothes and beach towel. The Penthouses are located between Surfers Paradise and Broadbeach each only 15 minute walk. Lifesavers patrol the beaches within 100 metres of your unit. We have a convenience store for your convenience, and underground secure parking.